Over the years we have had requests for unpainted replicas. 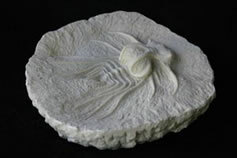 We very seldom offer unpainted replicas because we need to control the quality of the product available to the market. We have added eight smaller replicas that we don't offer in a painted version. All eight unpainted replicas are trilobites. Each unpainted trilobite replica comes with painting instructions like the one for the Dicranurus below, with a photo of the original (in black and white) at the top of the page for reference. The instructions are for guidance only and you are certainly welcome to paint your replica however you wish. These pieces are meant to give you a small idea what we go through to deliver the finished product on the larger specimens. The picture on the left is a photo of the original. The picture in the middle is a photo of the replica. Click on this photo to go to the page with the various replicas availabe for you to paint. Matrix: for the matrix we use stains (with solids) from Sherwin Williams. Colors can range from grey to tan or brown and can be blotchy. Whaterver you feel will give you a natural looking stone. You may need to expirament until you get something you are satisfied with. 1. Paint entire piece with the color you have chosen (top, sides, and bottom) for the matrix. Make sure that there are no areas which did not get painted. 2. Using a soft rag (an old t-shirt works well), lightly wipe off high points of matrix and trilobite. This should help bring out the details of the matrix. You might want to wear plastic gloves so you don't leave finger prints. 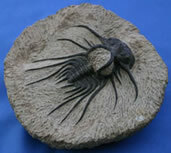 Trilobite: for the trilobite we use artist oil paints. Any paints you wish to use should do. It just depends on the final finish you are looking for. Oil or acrylics should work equally well. This one can be painted just black. But if you want to get fancy you can give the larger areas an under coat of raw sienna with a touch of raw umber. Paint the entire trilobit black, then lightly wipe over the high points of the lare area to allow some of the under coat to come through. This will add a touch of realism to the piece. Be careful not to get trilobite paint on the matrix. 1. Choose a starting point which seems logical to you. Usually a point which will not create a handling problem later on as you progress with your painting. Use mixture of raw sienna and raw umber or black. 2. Use a fine point artist brush so you can accurately paint the fine detail of the trilobite (#1 through #3 usually work best for me). The important thing here is that they are able to make a fine point at the end, for detail. 3. The photos above are provided to help you figure out what and how the piece should be painted. 4. You may have to paint both sides of the slender legs and spines or you may be able to accomplish the job by painting just the very top. The choice is yours. 5. In any case you want to make certain the edges are smooth and clean to make it look as realistic as possible. 6. When finished, set piece aside and let dry. Finish: After the piece has finished drying (this depends upon what types of paint you used), spray the entire piece with a clear matte finish (we use KrylonTM Matte Finish) a couple of times to preserve your paint job.